Launched - Tomei AV Consulting LLC recently launched as an independent audio visual consultant based in Central New York. Owned by Mike Tomei, it aims to provide AV management consulting, system design and project management to the higher education, K-12, corporate and commercial markets. 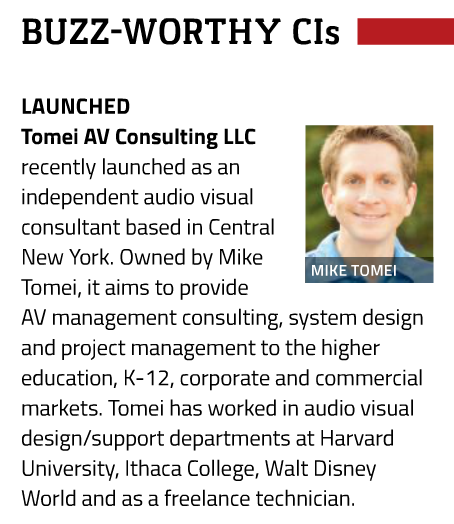 Tomei has worked in audio visual design/support departments at Harvard University, Ithaca College, Walt Disney World and as a freelance technician. "Audio visual system design is at the forefront of instructional technology, with concepts like flipped classrooms, lecture capture and active/collaborative learning environments all very popular right now. Not only are instructors the driving force behind these new teaching methods; administrators at brick and mortar higher education institutions see many of these ideas as selling points that will set them apart from the online institutions. 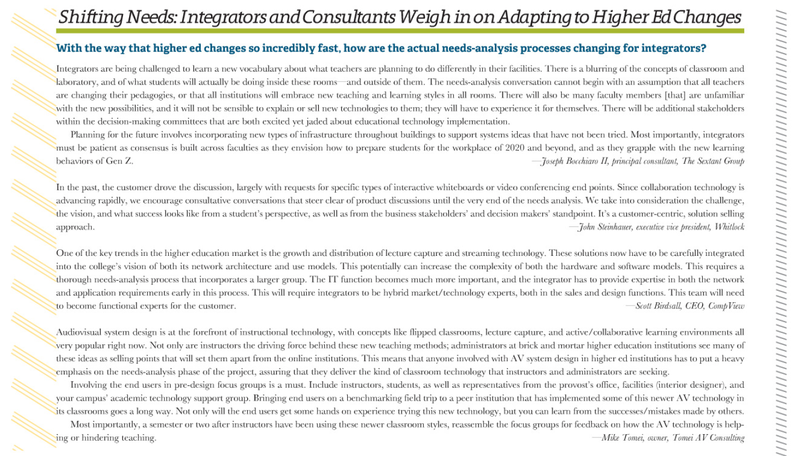 This means that anyone involved with AV system design in higher ed institutions has to put a heavy emphasis on the needs-analysis phase of the project, assuring that they deliver the kind of classroom technology that instructors and administrators are seeking. Involving the end-users in pre-design focus groups is a must. Include instructors, students, as well as representatives from the provost's office, facilities (interior designer) and your campus' academic technology support group. Bringing end-users on a benchmarking field trip to a peer institution that has implemented some of this newer AV technology in their classrooms goes a long way. Not only will the end-users get some hands on experience trying this new technology, but you can learn from the successes/mistakes made by others. Most importantly, a semester or two after instructors have been using these newer classroom styles, reassemble the focus groups for feedback on how the AV technology is helping or hindering teaching. -Mike Tomei, owner, Tomei AV Consulting"